What size is my child? A guide for sewists. A while ago I made a comparison chart of sizing systems for women. But I thought it would also be useful to do the same thing for children’s sizes. 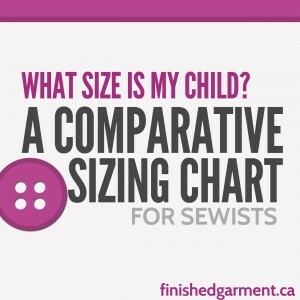 This is a rough guide to how children’s clothing sizes and sewing pattern sizes match up across the most commonly used clothing systems. Please click to enlarge. For more details, please read the notes below. 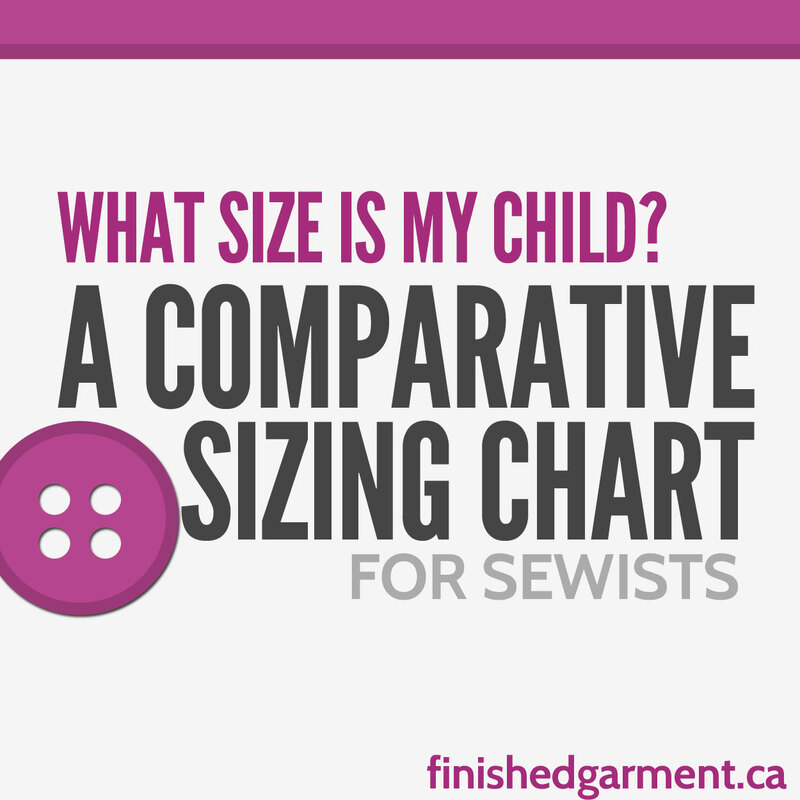 Size chart equivalents for kids – Includes ready-to-wear and sewing pattern sizes. I used the combined available size charts from major pattern manufacturers, clothing manufacturers and international size standards. The ‘Big Four’ pattern companies refer to companies like Butterick, McCalls, Vogue and Simplicity. The European Pattern companies include ones like Ottobre and Burdastyle, but also a number of pattern companies in France, Germany, etc. I didn’t include independent pattern company size charts, which vary a great deal, especially in the U.S.
Should I choose my pattern size based on this chart? Probably not. It’s always a good idea to read the measurements that come with a specific pattern for a better fit. Why are some sizes greyed out? The greyed out sizes are purely fictitious. They don’t exist on the size charts of certain manufacturers. What’s going on with sizes S,M and L? Those sizes are very approximate, and vary greatly among clothing manufacturers. In addition there is a range of S-L for babies and another for older children. Do you have suggestions? complaints? I hope you find the chart useful. If you have any comments or would like to suggest improvements, I’d love to hear about it! Please leave your thoughts in the comments. 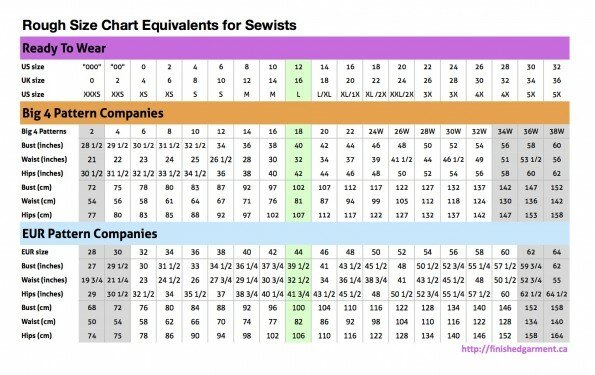 While I was writing up my list of Independent Sewing Patterns for the Plus-Sized Sewist, one of the things I noticed was how different everyone’s sizing system was. And the larger the pattern sizes available, the more the systems varied from pattern maker to pattern maker. I looked online for some sort of chart that would link up all the sizing systems. There were some good ones. The Named Patterns size chart includes lots of sizing systems, but it only goes up to size EUR 46. There is also a cute online clothing size conversion tool, but it doesn’t include measurements or pattern sizes. And there is a fabulous list by Cashmerette, that compares the sizing systems of some of the most popular independent pattern makers. But overall, there wasn’t what I needed, especially not in the plus size range, so I made my own. This is a rough guide to how clothing sizes and sewing pattern sizes match up across the most commonly used clothing systems. Please click to enlarge. For more details, please read the notes below. I used the combined available size charts from major pattern manufacturers, clothing manufacturers and international size standards. I didn’t include independent pattern company size charts, which vary a great deal. And for some indie pattern companies, that is part of their marketing and their charm. Pear shaped? extra curvy? petite? Some indie pattern companies are intentionally catering to that demographic and their size charts reflect that. The greyed out sizes are purely fictitious. They don’t exist on the size charts of major manufacturers. But since human beings do come in those sizes, I extended out the available sizes myself, using the same approximate measurement intervals. I made educated guesses. I know that is not exactly how sizing or pattern grading works, but since these sizes are not actually available, I figure my approximations are better than nothing. Since some of the larger “official” sizes are rarely, if ever available, my approximations are about as useful. Why did you only include EUR sizes 28-64? I stopped at size EUR 64. Again, human beings come in larger sizes, so the size chart could easily be expanded (and should be!). However, this includes all the sizes that I could find in my list of Independent Sewing Patterns for the Plus-Sized Sewist. I also found it extremely difficult to find consensus among clothing manufacturers about what exactly constitutes the 6X to 10X+ size range. The average bust size in the USA in 2004, according to Size USA was 40″. The green bar, therefore, is the average size of women in the USA. I found it very interesting that for many independent pattern companies, this was the largest size they made. Even Big 4 pattern companies often stop at size 18, and sometimes 16, for individual patterns. What’s going on with sizes XL, 1X and 2X? In theory, XL and 1X should be equivalent and XXL and 2X should be equivalent, but those sizes are very approximate, and vary greatly among clothing manufacturers. Is the sizing for 1x to 5x accurate? Maybe. There doesn’t seem to be a clear standard for those clothing sizes, at least not one that I could find. However, this chart best approximates the reported sizing used by significant number of large clothing manufacturers and distributors. 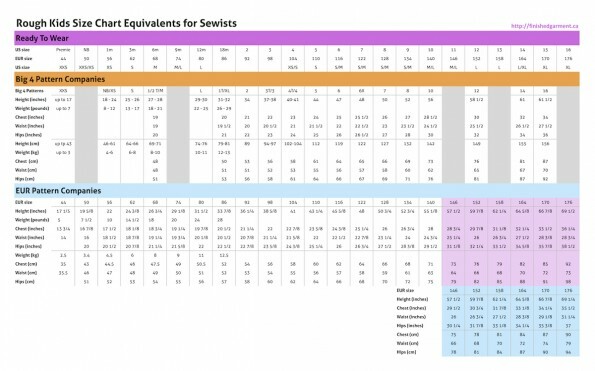 It’s also quite close to the KwikSew size chart for sizes 1X to 4X. I wanted to include that information as well, but I couldn’t see any easy way to incorporate those sizes and still keep the chart tidy and legible.